Well, the first blast of a decent winter has just come and gone. 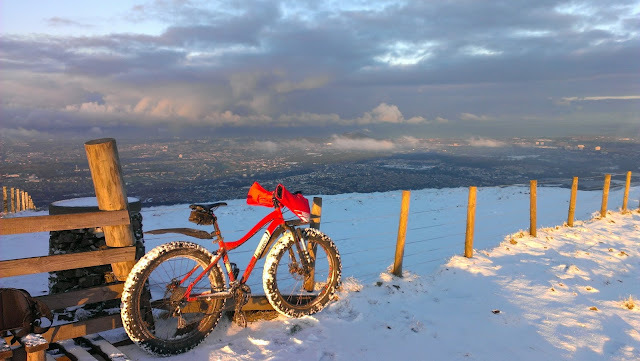 Already I've been cycling in the snow more than I did last winter so I thought it was worth a quick round-up of how it's been going. The first decent trip took me up Allermuir via Harlaw, Maidens Cleugh, and Castlelaw. However, due to a nascent blizzard I'd not set off until almost 2pm. However, I did get some beautiful clear blue sky as I set up towards Maidens Cleugh. On the way up, I bumped into PHRP Ranger Susan Falconer, author of the Cicerone Pentland Hills Walking Guide. We chatted a bit about some path repair work that the local mountain biking community are going to help with his year and, of course, about the bike. As I set off again I could see some low cloud approaching and was expecting a further snow fall. At the reservoir I headed towards Castlelaw, then up past the shooting ranges and along the big track that carries on over to Dreghorn. So far, the thin layer of snow hadn't been an issue. However, cutting off the track to climb Allermuir it wasn't long before the snow got wetter and deeper and I eventually ran out of traction. By this time, the low cloud had settled in and I just pushed the bike up the last couple of hundred metres to the mist shrouded trig point. Gutted not to get a view, I hung around a few minutes in the freezing wind until I could make out at first a slight thinning, then finally a break. With my late start, the low sun was casting an orangey-pink light over the summit so I quickly snapped off a few photos before my hands started freezing. From here, it was a straightforward descent, picking up my my ascent trail to the main track and then round the front of Capelaw and down to Bonaly Reservoir, the sun getting lower and lower, pinker and pinker as I went and it has completely set by the time I reached the track alongside Torduff that would take me back home. Overall, a nice wee run and the big fat tyres coped really well in the snow. My next ride was out to Listonshiels and back along the "Yellow Brick Road" to Wester Bavelaw. This time, things didn't go quite as smoothly. 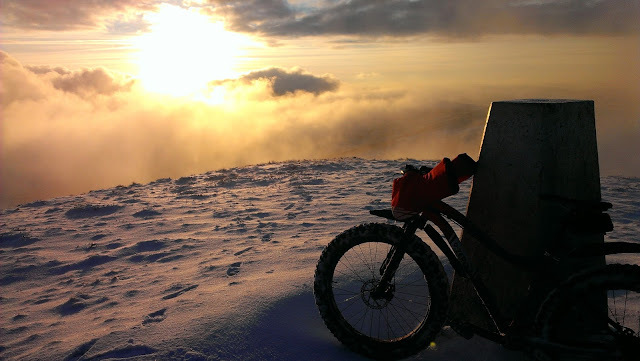 A damp easterly was blowing the snow around and pretty soon it was collecting all round the bike. Crucially, it also froze up the rear mech so I was reduced to just two gears (i.e. the front rings). This is a problem I've had before in these conditions and one of the reasons I'd initially decided to fit an Alfine (internal gear) hib to the fatbike. I'd subsequently removed this as I couldn't get the range of gearing I really wanted but I now considered a different way of using it. As a result, the Alfine has been re-installed and I've kept the dual rings up front too. This necessitated the purchase and installation of an Alfine chain tensioner. While not looking as "clean" and potentially introducing a point of failure, I reckoned this was a chance worth taking. My next ride was therefore with the Alfine fitted and I must say I'd forgotten just how it felt. Gear changing is a noiseless, smooth and quick affair, so mush so it's often tempting to think it hasn't actually happened. Pickup after gear changing is also instant. Overall. I'm very impressed and with the range of gearing now at my disposal I'm tempted to run the bike this way in the longer term too. In fact, with a slightly larger "middle" ring at the front I can extend the range even further giving me some really good gears for some road-inclusive island hopping I have planned. Waypost at Listonshiels. I love coming out this way as it has a wilder, more open feel than the area around Harlaw and Bavelaw. Thin snow over ice - always a bit tricky! These weird frozen waves were on Threipmuir Reservoir. It's amazing what you spot when you are just being observant. The Pogies in all their glory. The other modifications I've made this winter are mostly to stay warmer. The Hotpog Pogies may look like a set of over-sized boxing gloves but my hands remain toasty even with just a thin pair of summer gloves on underneath. The only issue is stopping to take photos etc as removing your hands from the pogies can result in them getting pretty cold pretty quickly. I also decided to try a different tack with my footwear. My Shimano MT90s have been great over the years and are worn on all my remote bikepacking trips. However, I've noticed that the leather soaks through and then, despite the Goretex liner, they start to feel really cold. I spotted some Salomon Snowshoe boots at Decathlon one day - waterproof and insulated, they sounded ideal. So far, they have been. I bought them large enough that I can still fit a decent sock inside and have wiggle room and they are perfect in the colder weather. A lot cheaper than bike-specific boots too!! So - with one round of snow gone, I've just about set myself up for the next. Here's hoping it won't be another 12 months. Good stuff Colin. Some cracking pics too. If my mech freezes up I'm going to use some warm fluid I store in my bladder to hopefully sort it out. Folk on motorbikes have been using the bar muff for years, a great solution to cold hands. Did yours not get a wee bit too hot? Mike - I was aware of the muffs/pogies when I was motorcycling but it was only the old fuddy-duddies that used them (hence me converting now I guess!). Those are the basic model on my bike and I've found them to be just about perfect in those biting winds. The only area of coldness now seems to be what I can feel under the grips.